My watch. No wind. No moon yet. Two hundred miles offshore from Costa Rica. The three others asleep, the sea silent. Warm salty droplets on my bare arms. A freighter appeared on the horizon at 2230 hours. From the lights I could see it was on a collision course with us. No worry, it was eight miles away. Make a log entry. Five minutes later it was considerably closer. The range lights were still in line, and both red and green running lights were visible. Too far away to worry, I decided. 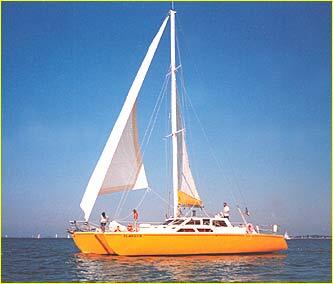 I looked at the orange drifter hanging limp on the forestay. In no time the freighter was closer. Surely their radar has picked us up, I thought, mildly apprehensive. To be on the safe side, I flipped on our running lights, usually left off to save the battery. About a minute later, I could see only their red light, which I decided meant that the freighter had veered off to pass us to port. Or had the green light picked that moment to burn out, or had someone stepped in front of it? The freighter was still rushing toward us at a ferocious rate. Again, to be on the safe side, I unfastened the xenon flasher from its place on the life ring and held it high. The brilliant strobe burst its staccato message into the night, lighting up our whole ship every other second, but I knew it would do us good only if someone were looking. We had read that some freighters are too short-staffed to carry full-time watches. We’d heard about disastrous collisions at sea due to cavalier regard for the night watch. It was really close now. I looked up at the empty heavens and prayed for a sudden squall that would send some power into the limp sail. Although I was reasonably sure it was giving us right of way, I called Captain Don out of a deep sleep. Then I heard the engines. The ship was upon us. I braced myself, hand tight on the tiller. If Don was perturbed by the sight and sound of this freighter bearing down on us, he hid it well. He took the flasher from me and stood on the cabin top to give it as much height as possible. 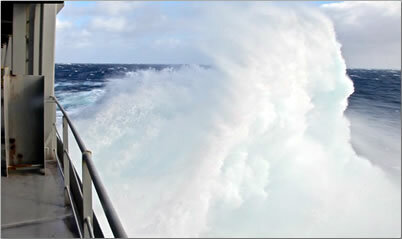 The engines screamed, the bow wave frothed white. A few seconds later the freighter passed us fifteen metres off the stern. The crew shone a spotlight on us, we heard them laugh, and they roared off into the blackness. I pushed my heart back down my throat and told Don to go back to sleep, thank you very much. Written by Diane Taylor, author of The Gift of Memoir, which offers guidelines for memoir writers. Gripping. What an experience that was. My goodness. And those idiots on the other vessel. Idiots, yes, and I can think of a few other choice words! Now that’s a dark sense of humor. It was pretty weird, but I smile when I think about it now. And it’s a great story for telling. Helen, there is more, and I enjoyed going back into those days. Remembered so much more than just that event. The four months were wonderful. And nice to see you here! Steady Captain Don and bosun Diane. Well done crew. Lynda, “steady” is a good word for Don. I know you’ve had a few close calls in past adventures, too. Wonderful writing Diane. I was right there. Thanks, Lynda. It was fun to go back and make a few edits on that story. Remember that old definition of sailing, “hour after hour of boredom interspersed with the odd moment of sheer terror”? Some truth in it! Goodness, that was drama on the high seas. True, Gallivanta. A few moments of drama in an otherwise calm night of just me and the sea. Solitude I’m grateful for to this day. Diane, my attention was on high alert as I read this. Their laughter was the worst kind; but thankfully you lived to tell the story. Wendy, I guess we’ve all had close calls! I wonder what was motivating those guys? We’ll never know, but they gave me fodder for a good story … glad you liked it. Thank you. Totally gripping and terrifying. What a bunch of jerks. Glad you were safe. As they say, fellow sea creature, ‘keep a good watch’ out there!